HTTPS domains have a reputation for security, but complete protection is not guaranteed. In recent years, malware has jumped the HTTPS fence. Because of this, other security measures – such as proficient antivirus software – are essential. The HTTP vs. HTTPS debate has been ongoing since the latter came into widespread use in the late 2000s. With the ‘S’ standing for ‘Secure,’ HTTPS sites boast extra encryption, to reduce your chance of contracting malware. By encrypting the communications between your browser on the website – using an SSL (Secure Sockets Layer) or TLS (Transport Layer Security) – HTTPS gained the reputation of providing ultimate security. Website owners and users feel confident that they can input data securely and are safe from malware. Today, over 65 percent of the web uses this protocol, including banks, retail stores, and even government organizations. However, cyber threats are continually transforming and recent years have seen many HTTPS sites contract harmful viruses. It’s time to ask ourselves an important question: is HTTPS secure? Or is more protection needed to ensure your safety online? The cyber-landscape is always developing – both the good and the bad. 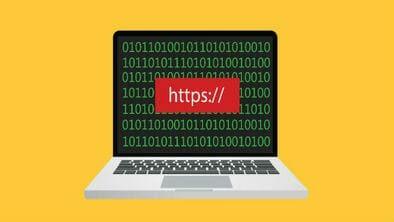 When sites jumped to HTTPS, so did cybercriminals. Since 2015, we have seen all major ransomware distributed via HTTPS, including Locky, Jigsaw, and Petra. In fact, 36 percent of global malware now uses this protocol – a dramatic rise from the five percent recorded in 2013. So what does this mean for the HTTP vs. HTTPS conversation? While HTTPS sites still offer privacy when inputting sensitive details, they can no longer claim complete security. Your data may be safe from direct theft when booking your holiday online or ordering the weekly groceries, but your computer is still at risk of contracting a destructive infection. As many organizations using this protocol still assume it’s impenetrable, they fail to conduct comprehensive reviews. Viruses are allowed to thrive without protest in these security blind spots, perhaps explaining the remarkable rise in HTTPS malware. If a HTTPS URL prefix doesn’t guarantee safety anymore, how can you tell if an internet site is secure? The short answer is: you can’t. There is no universal test to guarantee reliability on the web. Instead, use pre-emptive tactics to protect yourself from threats. Use a VPN service on your personal devices to encrypt your data on open networks. For business, a VPN protects P2P file-sharing and remote working. Ensure your passwords are unique, complex and changed regularly. Password management apps will help you stay safe and organized. Log-in systems can be set to require a code from a third-party device, such as your phone or dedicated hardware, which prevents brute-force attacks. Many resources have settings for unusual activity alerts. ID theft protection services offer a convenient alternative as they monitor all your data at once. You can never guarantee safety, so regularly backing up all your systems allows you to restore work if you fall victim. A comprehensive antivirus suite will detect breaches, alert you to threats and help fix any problem. As HTTPS sites still protect our privacy, the main threat is from computer viruses. Malware comes in many forms and can be incredibly destructive; from corrupting files to completely locking you out of your computer. Not only will antivirus software alert you of malware from breached HTTPS domains, but they will also support you take steps towards resolution. Good antivirus software offers a comprehensive range of features. Alongside performing regular scans and threat alerts, they provide intricate security features. Most industry leaders, such as Norton and TotalAV, include password management features – with auto-fill settings for ease-of-use. Web filtering and anti-phishing software also increase system security by flagging high-risk sites and infected links respectively. While there are many free antivirus services on the web, paid options ensure the highest level of protection. Not only do leading antivirus companies provide better performance and additional features, they also often include free firewalls. Combined, these products create security suites that promise near-complete protection from online dangers. Prices for reliable antivirus software can range from $32.99 (for products such as Norton’s standard security) to $229.95 (for deluxe cover like Kaspersky’s ‘Total Security’ plan). Although these annual sums may seem pricey, skimping on online security is an expensive risk. The cost of a breach can quickly reach $1,000s! Malware has infiltrated HTTPS; now we have to judge the security of each domain separately. However, using antivirus software can resolve this problem. By flagging threats before they happen and providing contingency during a breach, antivirus software allows you to surf the net securely and confidently.